The real stars of LA Noire aren't the cops, or the cars, or the bloody deceased. They're the fancy hats, of which there are surely more in this single game than there are in every other ever made. Put together. Being so critical to both your enjoyment and understanding of the game, then, we figured it'd be best if we took a real close look at them. Of course, if I took a real close look all I'd be able to tell you was that they looked just as fancy up close as they do from a distance. Not much help. So instead I had a chat with my boy Ricki Carroll, who works at Sydney gentlemen's establishment Strand Hatters. Who only sell hats. Fancy, dapper hats. "Let's start rolling with the basics", he tells me. "In the game you've pretty much got two basic types of hats: Fedoras, and Trilbys. The difference simply being that Trilbys have very short, snappy brims, usually down at the front (but not always) and sharply up at the back. Fedoras are the same, but with a wider brim." Sounds clear-cut, but it's not, especially given LA Noire's American setting. "There are two things though that are a bit weird, one that there's no real rule for when a Trilby becomes a Fedora, and two, Americans seem to almost always call Trilbys Fedoras." So which is most prevalent in the game? Having looked over the various shades of fancy hat LA Noire's characters cover their noggins in, Ricki says "In my honest opinion, most of the hats are felt Trilbys, with maybe one or two Fedoras in there. They're felt because typically these hats are made out of rabbit fur, and in America, especially in the first half of the 20th century, sometimes Beaver as well (or even a blend of the two)." Differentiating all those Trilbys, then, are the two ways the hat can be shaped up top. One is a cigar crease, the other a teardrop crease. If you take a look at this picture, you'll see the two compared: the cigar crease, viewed top-down, is a long thin valley in the top of the hat, while the teardrop crease is a wider, broader, more circular crease. The Panama Trilby. A very, very fancy hat. Still, only two real variations to be had there, that's pretty boring. With one exception. In the image to the right, the white hat is what's called a Panama Trilby. Unlike the common American Trilby, these puppies were hand-made in South America (in Ecuador, actually, not Panama! ), were very fancy hats back then and are still very fancy hats now. Indeed, today they can sell for thousands of dollars, should you ever want to look like either a Southern Gentleman or a South American Drug Dealer. And there you have it. 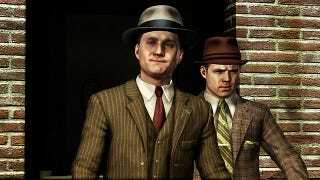 Next time you bend down to pick up the hat that got knocked off your cap during some fisticuffs - and just so you know, hero Cole Phelps (pictured up top) is rocking a "teardrop" felt Trilby - now you know just what it is.